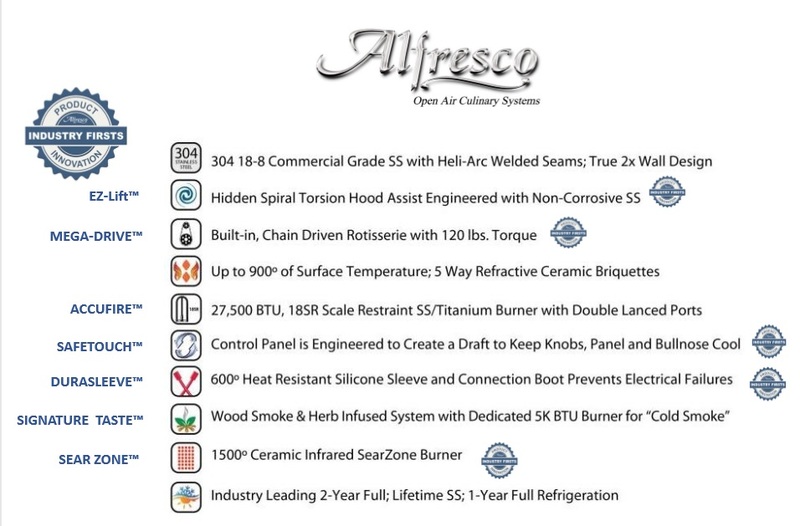 Alfresco manufactures the most innovative and luxurious line of commercial quality outdoor cooking equipment. The ALXE grills come in 4 sizes : 30", 36", 52" and 56". These grills feature quality components typically found in commercial kitchens. The grills can be configured with all stainless U burners or a combination of U burners with an infrared sear zone. Take a look at the ALXE Grill Review. They can be built into an outdoor kitchen setup or combined with a grill cart for a free-standing solution. Their grills are Made in the USA and feature high quality stainless steel, expertly crafted components, and professional-grade performance. Available features include sear zones, integrated rotisserie systems, halogen work lights, and hand polished accents. Together all of this adds up to one of the best grills available on the consumer market. Take a look at the variety of Alfresco models and sizes, and see which one is perfect for you. We also carry their full line of built-in grills, carts, outdoor kitchen appliances and accessories, and replacement parts. Alfresco's Equipment Selection has every outdoor appliance and component imaginable to compliment their Grills and create a true state of the art commercial outdoor kitchen. TheBBQDepot has been an authorized dealer AND service dealer for over 10 years. Purchasing from an authorized service dealer means if you need troubleshooting assistance, we are here. Not many "Retail Dealers" know how to help walk you through an issue. Come to the experts!